We’re starting a new tradition. 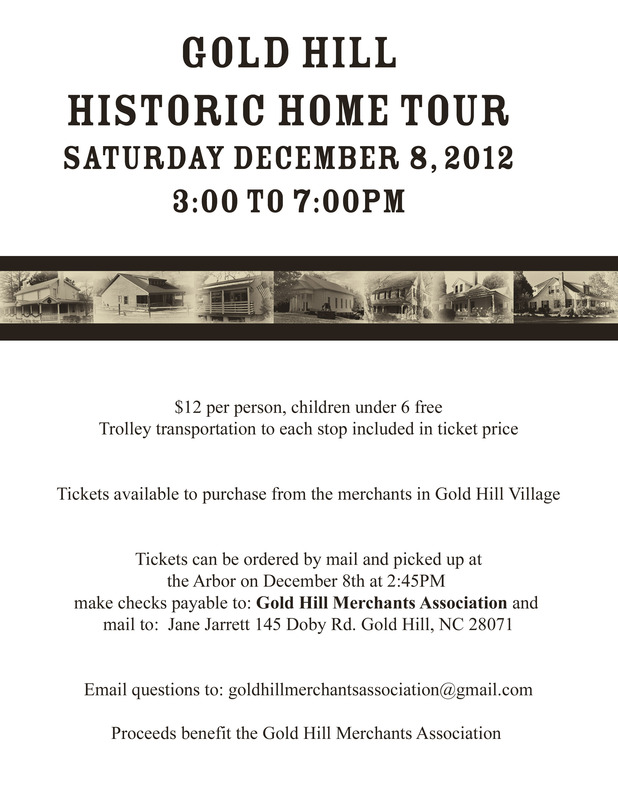 This year is the second Gold Hill historic home tour. Come and enjoy the history and see these great homes on December 8th from 3-7PM. Tickets are $12 per person with children under 6 free. The Salisbury trolley will provide transportation to each stop on the tour. Tickets can be purchased from any Gold Hill merchant or by mail. Click on the photo below for a larger view with the details! 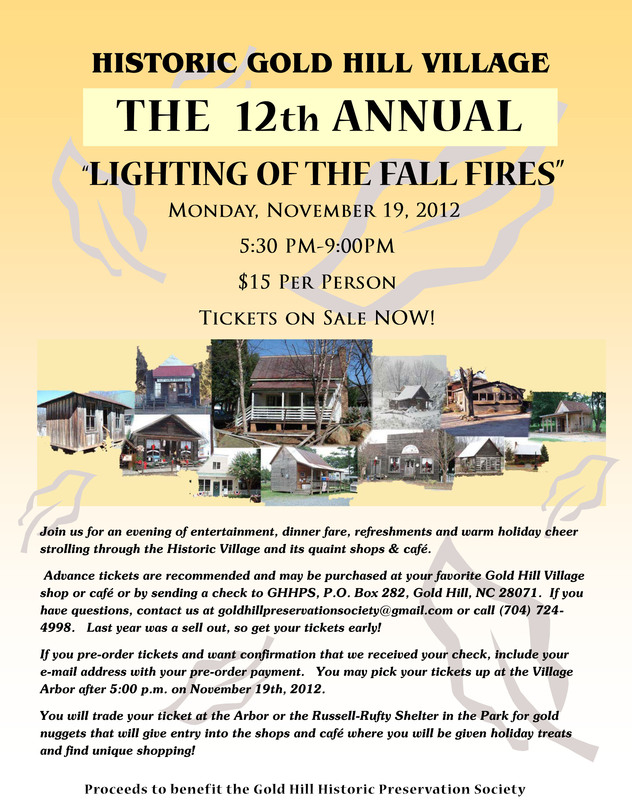 Fall is here and we’re ready for another “lighting of the fall fires” in Gold Hill. This event will sell out so order your tickets now or pick them up from one of the merchants in the Village of Gold Hill. This annual event is on November 19th from 5:30-9PM. Tickets are $15 per person. Each ticket is traded at the Arbor or Russell-Rufty Shelter in the Park for gold nuggets that will give you entry into the shops and cafe where you will be given holiday treats and find unique shopping. Click on the photo below for a larger view of all the details! 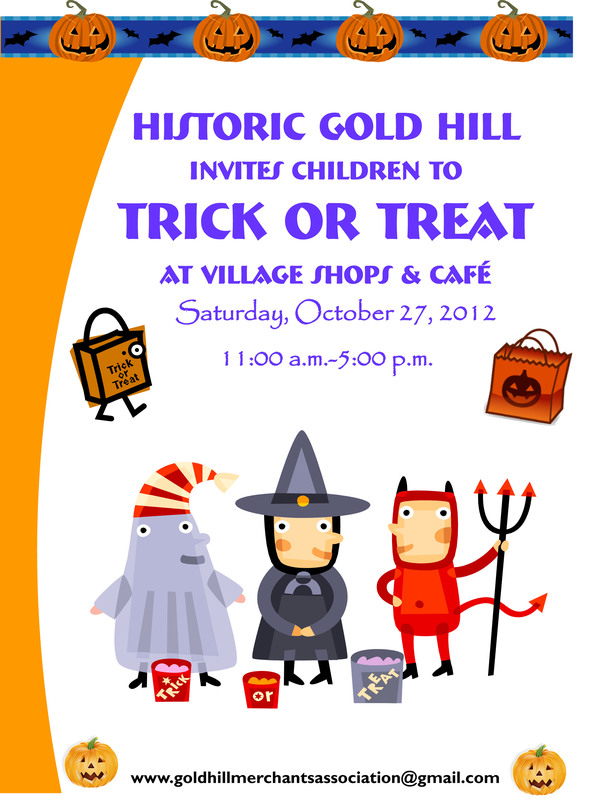 Bring your children to the Village of Gold Hill on Saturday October 27 for a safe Trick or Treat adventure with the merchants from 11AM to 5PM.